GET READY FOR AP CHINESE THIS SUMMER! 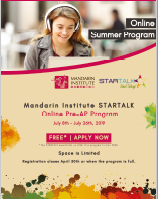 The Mandarin Institute STARTALK Online PRE-AP Program provides students from across the US the opportunity to strengthen their Chinese language skills whether in preparation for an AP Chinese course or for those who just want to improve their Chinese. 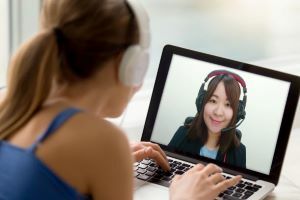 The online learning environment is powered by Artificial Intelligence (AI) technology which incorporates the best strategies for second language acquisition that makes learning Chinese more efficient, effective and engaging. Through the theme of Innovation and Invention, participants will learn about the Four Great Inventions of China (paper, gunpowder, printing, compass), compare and contrast American and Chinese ingenuity and progress through to innovations in today's social media while exploring the impact of these innovations on our lives. Each day students will engage in 90 minutes of online instruction with a teacher and 3 other students in addition to ~ 2 hours of self-paced learning which includes independent, pair and group projects. Upon completion of the 50-hour program, students will improve their proficiency level with exposure to AP content and instruction. The Mandarin Institute STARTALK PRE-AP program is collaborating with Ponddy Education to provide students with a pathway to AP Chinese. All applicants will be given complimentary licenses to AI tools that help students to read, whether or not they are accepted into the program. Students must have access to a computer/laptop/tablet with a webcam and internet connection. It is recommended that students use a headset with a microphone for the best audio. recording. There will be some questions about an article that they will read. Students will be notified within 3 days if they are accepted into the program. * Only apply if you can attend all dates. Significant financial resources are invested in each participant and only those who can benefit from the entire program experience will be accepted. The STARTALK award lets us offer this program tuition FREE to students. STARTALK is a component program of the National Security Language Initiative (NSLI) which seeks to expand and improve the teaching and learning of strategically important world languages that are not now widely taught in the US. STARTALK’s mission is to increase the number of Americans learning, speaking, and teaching critical need foreign languages by offering students (K–16) and teachers of these languages creative and engaging summer experiences that strive to exemplify best practices in language education and in language teacher development, forming an extensive community of practice that seeks continuous improvement in such criteria as outcomes-driven program design, standards-based curriculum planning, learner-centered approaches, excellence in selection and development of materials, and meaningful assessment of outcomes. or (408) 863-2498 with any questions.